All of Henry Hill's (Ray Liota) life, he wanted to be a gangster. As a teenager, Henry got the opportunity to run small errands for gangster Paul Cicero (Paul Sorvino), and from that moment on, this was the life he led. Henry and his ill tempered friend Tommy DeVito (Joe Pesci) are eventually taken under the wing of James Conway (Robert De Niro). They hijack truck shipments, sell the goods on the black market, pay their tribute to Paul, and live a decadent lifestyle. Of course, they have to commit the occasional murder and extort people from time to time, but that all comes with the territory. After a minor bust and short time in prison, Henry and his group get involved in dealing cocaine, even after being warned by Paul Cicero to lay low and stay out of the drug business because it brought too much heat. Things start to go really bad for Henry as he starts to regularly use cocaine. Combined with marital issues, disobeying Cicero, and a possible federal investigation, he starts to question who he can trust and if he has any real friends left. He becomes paranoid that his life could end any second, and he may be right. Based on the true life of mobster Henry Hill, this movie was nominated for Best Picture, as well as a string of other Oscars, and deservedly so. 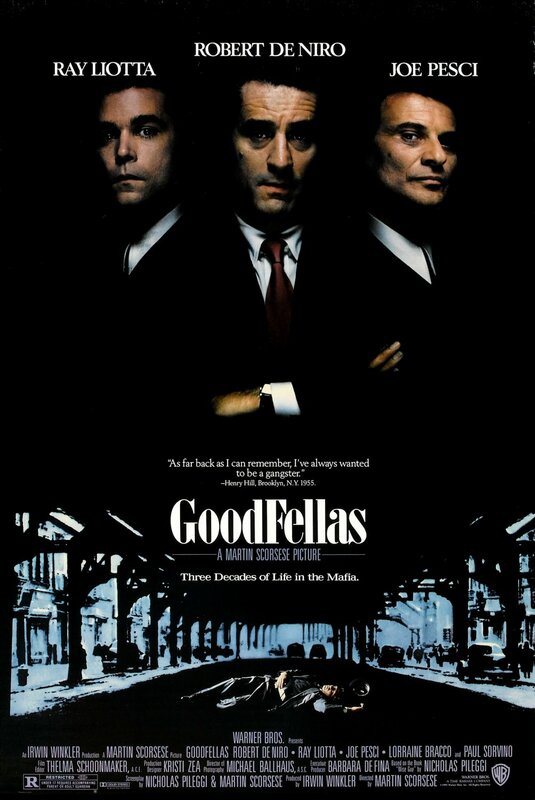 "Goodfellas" is a brilliant and gritty look into the mafia lifestyle in New York from the 1950's up to 1980's. It is full of amazing performances, most notably from Ray Liotta, who plays Henry Hill, the ambitious young man who fantasized about the mob lifestyle that was his eventual downfall. Other standout performances include the likes of the fantastic Robert De Niro as Henry's primary role model James Conway, who teaches him the ins and outs of the business. De Niro is a powerhouse and adds his signature gangster feel and flare to this movie. Loraine Bracco, who was nominated for her performance as Henry's wife Karen, goes from being the girl next door to completely accepting and deeply involved in Henry's criminal lifestyle. From there, she becomes the vengeful scorned wife, and her performance definitely deserved recognition. And, of course, there is Joe Pesci, who won Best Supporting Actor for his flawless portrayal of the hot tempered Tommy DeVito. He has one of the most memorable scenes in the movie, asking Henry, "What do you mean I'm funny?" Together, these people put on an exceptional and dominant ensemble performance for the ages and one that has still held up to this day. We have to say, we are big fans of Martin Scorsese and this is certainly up there among his extremely long list of great movies. Whenever you see his name attached to a film, especially an R-rated film, you usually can expect a long, detailed and enthralling story, some stunning visuals and camera work, and violence, lots and lots of graphic violence. That's exactly what you get from "Goodfellas," and we love every minute of it. He was at the top of his illustrious career with this movie. Scorsese has this crazy ability to get into the depths of the mob lifestyle so extremely well and he captures not only how it was to be a mobster, but the style of the time period, too. You really understand the appeal this life could have for some people as it offers a level of camaraderie and a feeling of family that is sometimes not found in actual families. It doesn't shy away from the negatives either, showing without a shadow of a doubt that this lifestyle more often than not leads to an early death or prison sentence, and that "the family" is only really tight when it's good for business. This movie is a classic masterpiece in American cinema. It is a quintessential mob film, and if you were writing a list of the greatest mafia films ever made, this would most certainly be on the short list, probably up at the top right behind "The Godfather" films. One year ago, we were watching: "Her"